THE WORLD’S FIRST live cataract surgery is going to be broadcast live over the internet from Malawi today. Broadcast live on Google+, viewers will get to see a live 20 minute operation on Winesi, a man living with blindness in Malwai. The next day, viewers are invited to tune back in to witness the joyful moment when his bandages are removed and he can see again. The life-changing operation can be viewed live today at millionmiracles.org, with the results of the operation being shown at 1.30pm (GMT). A Million Miracles is a three year appeal which aims to raise more than €35 million to support one million sight restoring cataract operations for people living in developing communities in Africa and Asia. They will also help establish an innovative new approach to providing cataract surgery in Kenya, Malawi, Mozambique, Uganda and Zambia. 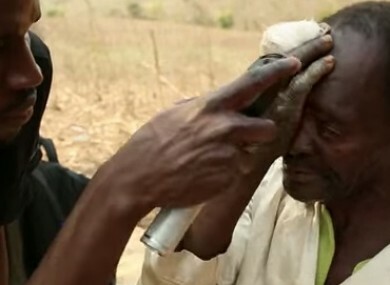 Cataract is the world’s leading cause of avoidable blindness, with an estimated 20 million people suffering needlessly. Over 80% of blindness in developing countries is avoidable. In this video, former Abercrombie and Fitch model and BBC Merlin actor, Eoin Macken, who travelled to Mozambique in August as a Sightsavers ambassador, speaks about the good work being done and reveals the joyous moment a man named Mario was able to see for first time in 10 years. It costs on average €36 for an adult cataract surgery that allows the miracle of restoring a person’s sight. To watch the life-changing operation today, click here>>> To support the campaign, simply text SIGHT to 50300 to give a €4 donation. Email “World’s first live cataract surgery to be streamed from rural Malawi”. Feedback on “World’s first live cataract surgery to be streamed from rural Malawi”.